A Lincolnshire charity is looking for ‘Paperclip Heroes’ to take on its latest challenge. 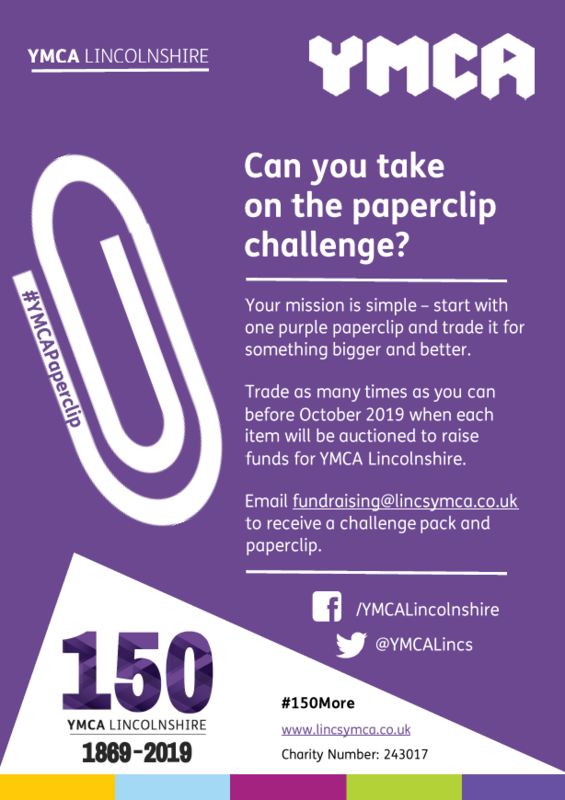 YMCA Lincolnshire has launched a new initiative today (2nd April) called the Paperclip Challenge. The aim of the challenge is simple – you begin with a purple YMCA paperclip and trade it for something new. You keep trading for bigger and better items until the finale event in October this year when everything will be auctioned for the charity. Colin Young, Managing Director at Golding, Young & Mawer Auctioneers and Valuers, who you might recognise from BBC’s Bargain Hunt, is championing the challenge. Colin said: “This is an exciting and fun opportunity to support a local charity in its 150th year. All you need to do to get involved is contact YMCA Lincolnshire for a purple paperclip. The idea was inspired by Canadian Kyle Macdonald who decided to trade a red paperclip in 2005 on Craigslist in America. He successfully swapped 14 times making his final trade for a two-storey farm house in 2006. Caroline Killeavy, Chief Executive at YMCA Lincolnshire, explained: “This challenge is something fun and engaging in support of YMCA Lincolnshire in our 150th year. We think everyone across Lincolnshire can get involved in it and we’d love to see schools, businesses and organisations across the county taking part and trading with each other. So, Paperclip Heroes, your mission is simple – start with a purple paperclip and trade it for something bigger and better. Trade as many times as you can before October 2019 when each item will be auctioned to raise funds for YMCA Lincolnshire. You could swap your paperclip for a pen, and your pen for pencil case, the pencil case for a hardback book etc.